Section 37: Bituminous Seals has been greatly revamped and expanded in Caltrans' 2010 Standard Specifications. All of the previously existing information seems to have remained the same (albeit in different format) but the biggest change of which is the addition of specifications for Polymer Modified Asphaltic Emulsion Seal Coat. Much of this addition does not affect aggregate suppliers but one thing to notice is that the aggregate screenings are a different gradation and cleanliness value for the Polymer Modified Emulsion Seal Coat than the standard Asphaltic Emulsion Seal Coat. If you're in the seal coating business I greatly recommend reading over the new version of Section 37. The Caltrans 2010 standard specifications can be found in pdf form at http://www.dot.ca.gov/hq/esc/oe/standards.php and are now for sale in book form on the Caltrans website here. There have been varying opinions of the Tensile Strength Ratio (TSR) test and how well it really reflects moisture sensitivity. Because of these concerns, Caltrans is currently moving towards the replacement of the TSR test with the Hamburg Wheel Tracking Test which originated in Germany in the mid 1970s. The test examines the susceptibility of the HMA to rutting and moisture damage. Hamburg Wheel Tracking Device (HWTD) from (Stuart and Youtcheff, 2002). The Hamburg Wheel Tracking Test uses a steel wheel with weight that rolls over the sample in a heated water bath. A designated number of passes are performed on the sample. I'm not sure what number Caltrans will settle on but in the United States, 20,000 passes seems to be used very commonly. The rut depth is measured by the machine periodically, usually every 20, 50, 100 or 200 passes. 20,000 passes can take around 6.5 hours whereas the entire test can take around 3 days. As you know, this is not much better than the TSR test so it doesn't look like we'll be shortening our mix design turn around time in the near future. APA Samples showing rutting after 8,000 load cycles. *This chart's data is for the Asphalt Pavement Analyzer, not the Hamburg Device but illustrates the terminology well. This type of information can tell us not only at what point in a roads' life it will become moisture sensitive but also how much the moisture will affect the road once it hits that point. Studies have found that there is good correlation between the Hamburg test and field performance but it has also been determined that the test can fail to differentiate between some mixtures. If you are interested in some of the more nitty gritty details there is a great writeup about the test by the Federal Highway Administration here and an evaluation of the Hamburg test for Caltrans by UC Davis here. In the new 2010 standard specifications there has been a change to Section 26-Aggregate Bases. The most exciting of which is that there is no longer a provision that only 50% of the aggregate base can be made from recycled materials. It is now allowed to have any combination of broken stone, crushed gravel, natural rough surfaced gravel, sand, and/or processed reclaimed asphalt concrete, PCC, LCB, or CTB. The Caltrans 2010 standard specifications can be found in pdf form at http://www.dot.ca.gov/hq/esc/oe/standards.php and are now for sale in book form on the Caltrans website here. At least 90 percent by weight of Class 3 permeable material must be crushed particles as determined by California Test 205." The 2010 standard specifications can be found in pdf form at http://www.dot.ca.gov/hq/esc/oe/standards.php and are now for sale in book form on the Caltrans website here. Sealcoating is a chemical that is applied to preserve and protect asphalt. Sealcoating can be a tricky business and sometimes it may not be a necessary maintenance feature for your asphalt. Sometimes, it’s a must have and should be performed on an annual basis. Sealcoating maintenance agreements can be made with your asphalt contractor when asphalt is installed. Sealcoating can be applied to asphalt in two ways—brushing and spraying. Many times, both methods are used together. Brushing sealcoating is a time consuming process and is best used on cracks, gaps and smaller areas of asphalt. Spraying sealcoating works best for large areas and is performed quickly with a machine. When receiving bids for sealcoating your asphalt, always ask your prospective sealcoating contractor how many coats of sealcoating they plan on using for your project and whether or not it will be brushed on or sprayed. You’ll also need to know how long it’s going to take, especially when it involves a commercial area that is heavily used. The majority of sealcoating materials typically last about 1-2 years. Sealcoating life expectancy often depends on the weather conditions that the asphalt is subjected to. Wet weather, ice, snow and sunlight can all affect the lifespan of sealcoating. Asking your prospective sealcoating contractor exactly how long your sealcoating project is going to be covered under a warranty or guarantee is a great idea; just be sure you get it in writing. In many cases, a maintenance contract can be created when you get an estimate for the asphalt paving cost from your prospective asphalt paving contractor. This way, if any problems occur while the maintenance agreement is in effect, it will be repaired by the asphalt contractor and not at cost to you. For commercial asphalt, line striping may be necessary. Parking lots and other asphalt areas that need to keep traffic flow properly maintained benefit from a fresh line striping after a new application of sealcoating has been applied. Some sealcoating contractors do not perform line striping, so always ensure that it’s going to be in the bid if it’s needed. Since some sealcoating companies don’t perform line striping projects, a line striping company or another asphalt company may need to make a bid on your project. Always make sure you get a written document that explains each and every material that will be used on your project, as well as a timeline the job will be finished in to ensure costs don’t go up in the middle of the project. Below is a simple video from Smart Planet that explains pervious concrete. Caltrans has released a new version of CT 207: Method of Test for Determining Specific Gravity and Absorption of Fine Aggregate. The new test method can be found on the Caltrans website and here: CT 207. The test method’s scope now includes the bulk specific gravity (oven dry) and apparent specific gravity and is no longer specifically for use in portland cement concrete. Your balance is now required to have a minimum capacity of 2000g instead of 1000g. The test method has been converted from metric to English units. The test method no longer specifies that your volumetric flask has to be calibrated to 0.15 mL at 23˚C but instead only specifies that it have a mark to indicate a volume of approximately 500 mL. A water tank is now specified in the apparatus section w/ a constant temperature of 73 ± 3˚F and enough depth to maintain the water level above the 500 mL mark on your flask. It is now required to wash the sample over a #200 sieve screen and dry back to constant weight before beginning the test method. Previously there was no wash process involved. The sample must be soaked for 24 ± 4 hrs now instead of the previously specified minimum of 15 hours. After decanting the water from the sample, the sample is to be spread on a nonabsorbent surface. In the past it was recommended to spread it on a porous (in other words absorbent) surface. It is now specified to stir frequently to insure homogeneous drying and to break up clumps. Stirring is now heavily encouraged and explained. How the tamping occurs is now explicitly explained including that each drop should start about 0.2in above the surface of the fine aggregate and that you should clear the material away from the base of the cone before you lift it. The test procedure now specifies the sample to be 500 ± 10 g instead of 500 g.
When introducing water to the flask with the SSD sample, it now says to fill the flask to approximately 90% capacity vs. “almost to the 500 mL mark” in the old test method. It now notes that manually rolling the flask could take 15-20 minutes, although it is not specified as required. It now specifies that when filling the flask to the calibrated capacity, you should measure to the bottom of the meniscus. The oven-dry mass is no longer found by weighing a split of the SSD sample. Now you will use the same material sample that you had in the flask. You no longer weigh the flask empty; all of the weights in this test method are in the flask so you will weigh the flask with 500 mL of water in it as well as with water and the SSD sample. Because of this change, the calculation has changed slightly as well. The test method now gives you calculations for not only Bulk Specific Gravity (SSD) and Percent Absorption, but also Bulk Specific Gravity (Oven-Dry) and Apparent Specific Gravity. There is now an example test result summary at the end of the test method. This new version of the test method is much more descriptive and well formulated. It should come as no surprise to you but this test method is notorious for creating disputes between contractors and Caltrans. Hopefully with this new version there will be less problems and all labs will be able to obtain similar results. My only complaints with this version are as follows. The majority of the test method species weight in grams but the weight of the tamping rod is specified in ounces. Secondly, in step 4 of the test method, it says to fill the flask to its "calibrated capacity" but it would be much less confusing if it read "to the 500 mL mark". Finally, the biggest issue that I have is with the photos on the table. I think this table and the photos will do a great deal of benefit for the testing community but the third photo, the one that the technicians really need to see, is blurry whereas the other two are perfectly clear. It would have been very helpful to have a clear photo here. Overall I'm excited about the new test method and hope that it helps in obtaining better correlation with our local districts' Caltrans labs. Happy Reading! Here's an interesting article that explores the public's perception of poor quality asphalt. It's another source of more information about the quality process when it comes to producing asphalt and laying it down. I came across this article tonight and I thought of you. http://www.good.is/post/california-cities-start-recycling-roads/ I just wondered what you thought of it. The article says the technique California is starting to use to resurface their roads is way better than the old way. It is also greener. I was wondering if there were any drawbacks that you knew of. Recently I attended a meeting where we discussed this new process so I figured I'd discuss it here for you all. The cold in place recycling process or "train" is a pretty simple process. 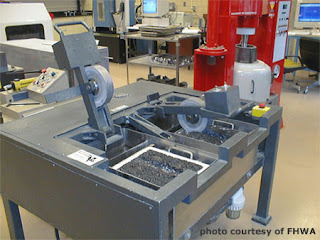 A milling machine at the front of the train mills off the existing pavement down to base rock (typically 2"-4"). This material is then conveyed to a screening/crushing machine where the material is reduced to the size needed for the mix design. From here the material is mixed with a recycling emulsion and laid down on the roadway in windrows. The material is then picked up by a shuttle buggy and put in the hopper of a paving machine where it is laid down as a fresh mat. After that, traditional rollers are used to compact it. The material is a dull brown when it is laid down and as the moisture from the emulsion evaporates it turns to a nice black. Once it has changed to black, traffic can be put back on the road; this can be as soon as 90 minutes after paving. There are some hesitations about this process here in California but overall it could be a much better method than traditional pavement as far as tax payers are concerned. Like the article Amanda mentioned says, most of the time it is much more monetarily beneficial because you don't have to pay to haul the old asphalt away and haul the new asphalt to the job. In California we're only allowed to put 15% recycled asphalt back into new asphalt mix for State jobs so we haul all of the asphalt back to the plant, crush it down, load some of it into the hot plant, send that mix to the job and lay it down again. With the "train" process it does it all in one place and uses 100% of the old asphalt. Also, this new method emits lower emissions and creates lower pollution. 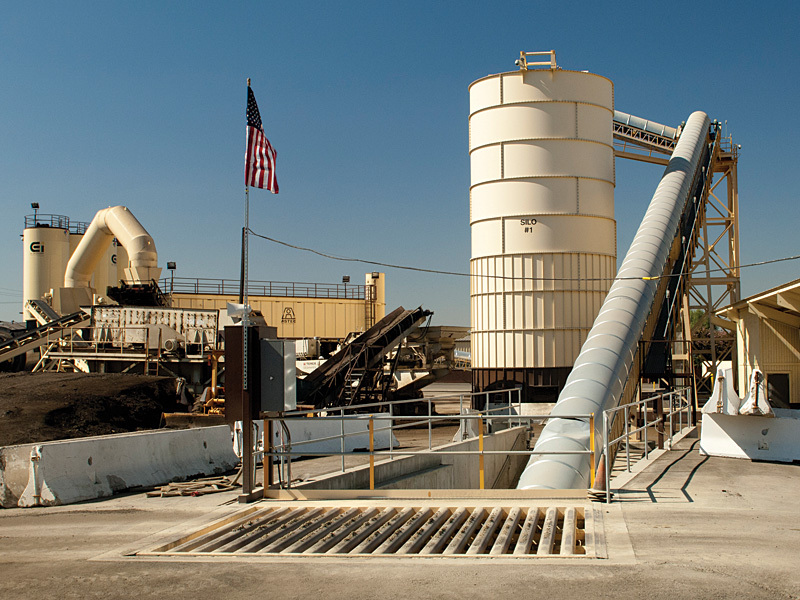 At a conventional hot plant you have to use fuel to dry out the aggregates and heat the asphalt binder. You then mix them together at a temperature of usually around 350 degrees so that the mix can make it to the job still hot. This creates a lot of fumes in the air. The train process doesn't heat up the material while mixing it with additives. This creates far less fumes than producing and transporting conventional mix would. The biggest worry about the cold in-place method is whether you are getting as quality and consistent of a product. It is difficult to assure that you are not picking up base rock with the asphalt from the old road until it is too late. Many roads are laid in parts at different times as they need to be replaced so you could also be grinding a road that has different types of asphalt and knowing to adjust your equipment accordingly is extremely difficult and almost non-existent. In addition, the train may be milling a road that only has 2" of existing pavement but they are supposed to lay down 4" in its place. This may not be an issue if there have been an adequate number of cores taken. If the operator knows where the pavement is thinner than others he can make adjustments to how he is paving. In an instance where there is not enough pavement to recycle, windrows of RAP brought in from outside sources can be laid down and picked up by the machine to subsidize it. There has also been discussion that too much aggregate material is lost due to weathering over time and to make a similar product to that of the conventional mix you would have to add in the fine material that is lost over time due to water and traffic. Honestly though, I'm a strong believer that if it's been tested and proven in places all over the world then it's probably a good process. It should also be noted that this process should only be used to recycled distressed PAVEMENT. It will not fix existing problems with the base or subbase and this process has a higher risk of failing if there is a soft subgrade. I know they're using this method a lot in mountain areas and a lot of states up north because it is sometimes really hard to get material to and from a job site which could be hours from an asphalt plant. In addition, the process is completed so quickly that you only need to close down the lane for a few hours, so mountain roads with only two lanes don't have as much traffic build up. California has already seen a few big experimental jobs with this technology up and down the state and there are many people that say that this is the future of paving in our state so keep your eyes open! Traditionally oil tanks are laid down horizontally. I believe this was under the theory that if you place the heating elements on the bottom of the tank you can cover more surface area to keep the oil warm and consistent. One of the plants I worked at also stood their tanks up vertically like the tanks shown above and when I asked why they did this I was pleasantly surprised. One of the biggest reasons is space. Many hot plant locations are in urban areas and they do not typically have space to lay out the tanks horizontally, as seems to be an issue with the plant above. As you may have noticed, standing the tanks up vertically takes up less than 1/4 the space it would take to lay them down horizontally. The other reason was an engineering reason. Heat rises. Each tank has a heating element on the floor of the tank and as the bottom of the tank is heated, the heat rises to heat the rest of the oil in the tank. With good insulation, you can use less energy with a smaller heating element to heat the entire tank, granted it might take a little longer than it would with a horizontal oil tank. In addition, many vertical tanks also have circulators that move the oil around in the tank to maintain a consistent temperature. It's a pretty neat technique that can save the company money and space. I've actually never seen a setup like this one and I was extremely excited when I saw it. The grate above is a drive over depository for aggregates. Bottom dump trucks, transporting the plant's aggregate supply from a nearby quarry, drive over this grate and dump their load through the grate (also called a grizzly). The grates stop any over sized materials (if any) and the rest of the rock drops through to the conveyor coming out from underneath it. This conveyor takes the rock to the top of one of the designated aggregate silos where it is deposited for future use at the hot plant. The hot plant can meter the amount of rock from each aggregate silo using their automated controls and no loader is used at all! What I love about this set up is that not only is it going to lead to lower operating costs but also that it is all enclosed. 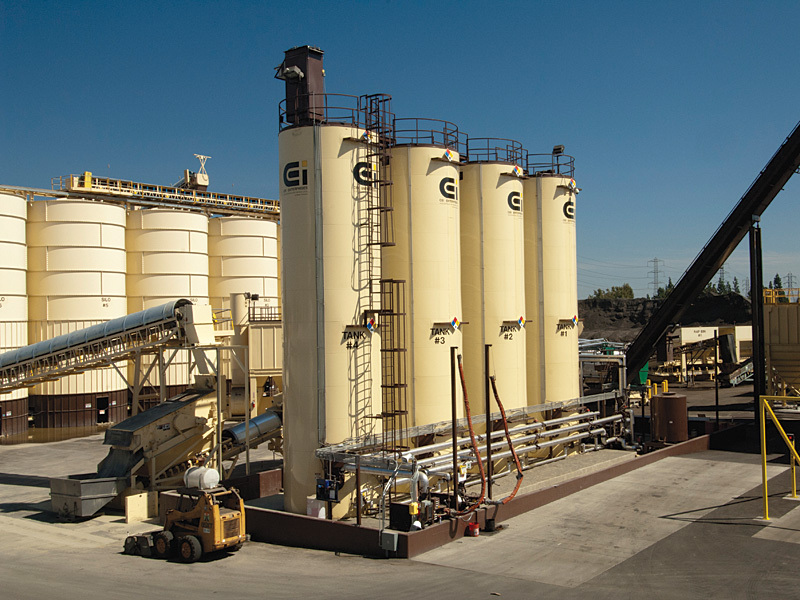 California is quickly moving towards tougher and tougher dust regulations for hot plants and this setup will come close to eliminating dust at their hot plant. In addition, (as if that wasn't enough!) having the rock enclosed in silos with this setup will also help out a ton with storm water requirements since you don't have aggregates which could have chemicals or minerals that can negatively affect runoff sitting in the rain. AND not having wet material because of the rain means lower dryer costs! As an operations person I'm really excited to see these types of developments but as a quality control person I'm also a little hesitant. One of the reasons that many operations choose not to use aggregate silos is that they have a propensity to segregate material. As I mentioned here when aggregates are dropped from a distance the coarse materials can roll to the outside and the fines stick in the middle. This could lead to coarse materials on the outside edges of your silos and fine materials in the center which can affect your hot mix. 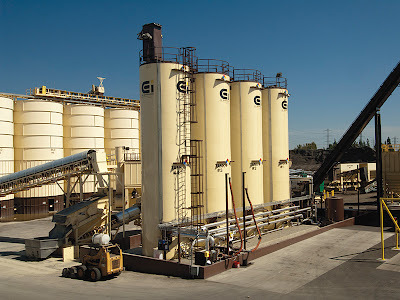 There are several ways to combat this though, such as using a gob hopper, so I think that aggregate silos still have a chance at being really great if they are set up and monitored properly. My other curiosity is whether the inherent moisture from the aggregates in the silos will drip down to the bottom of the silo leaving the moisture content of your aggregates inconsistent and possibly affecting your oil content (especially with a drum plant). However, with traditional moistures around 2-3% I'm not sure that it will make that big of a difference in the long run. I just thought I'd let you all in on some of the possible negatives though since there is no such thing as a perfect setup. Overall I think that this facility, belonging to Kelterite, is leading the way to what we're going to be seeing more and more of in the future. Thanks to one of our readers we've found out that the new CT 304 that I spoke about a couple months back (here) is not to be used yet. Soon after the new version was posted on the Caltrans website it was taken down. I looked into it and this is because they are revisiting whether the binder content should be reported as total weight of dry aggregates or as total weight of mix. I'll keep you all updated when the new version is re-posted on the Caltrans website and let you know what they decide. Sorry about the confusion! I was on vacation this past weekend and stumbled upon this patch of road and being the nerd that I am I had to take a photo and share it with you all. A few weeks ago someone asked me if alligator cracking can be caused by tree roots. 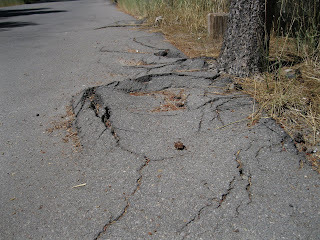 The photo above is an example of cracking caused by tree roots. As you can see, the cracks are actually raised up from the ground instead of depressed like you will commonly see with alligator cracking. Maintenance for roads with cracking due to tree roots is a little complicated. In 99% of cases you will need to remove the tree to fix this on-going problem because even if you dig out the roots that are currently under the pavement, the tree will grow new ones and you will be right back where you started. The tree shown in the picture above is in a state park so the solution to remove it will not work. If you need to keep the tree in place you'll need to find a way to reduce the roots below the pavement. Typically a tree will have 6 to 10 large roots that grow outwards from the tree trunk which provide stability for the tree. It is not advisable to cut these roots because the tree may loose its stability and become a safety hazard. Cutting these major roots will also leave a large portion of the root exposed to the elements which can cause rotting and decay under the soil's surface and may ultimately result in the tree dying. If you find that these roots are the ones that are causing your cracking, you are better off removing the tree. If not, you will dig out the area below your pavement, saw off the roots that are under the pavement area and install a root barrier at the edges of your pavement. The barrier should be placed to a depth of 18-24 inches. If you have good soil depth, the roots will grow down and continue to grow laterally below the barrier but will not have as large of an impact on the pavement you install. A common mistake that contractors make is by only trenching along the edge of the pavement to cut the roots and install the root barrier. By doing this they leave dead roots under the pavement which will rot and decompose. Once this happens, the pavement can shift and create more cracking. It is better to dig out the entire root system under the pavement. Another option is to pave with rubberized asphalt. Although the rubberized pavement will still upheave from the roots, it will not crack into sharp cracks as you see above and form rounded mounds instead. This can help aesthetically as well as reduce the tripping hazards from pedestrians and bicyclists. If you are planning on planting new trees near pavement keep some things in mind. Most tree roots are 2-3 feet below the surface where the good soil is and can be as much as three times the length of the longest branch on the tree. It is recommended that your pavements are 5 feet from any trees to eliminate the chances of the roots damaging it. There are also certain species of trees that will be better suited for planting neared paved areas. Avoid trees with roots that swell and raise near the surface. Also avoid trees with dense canopies that will reduce the amount of sunlight available to the pavement. The lack of sunlight will make it harder for moisture to evaporate which can encourage water damage to your pavement. Some good choices for trees to plant near pavements or sidewalks are hedge maple, cornelian cherry, green ash, chinese juniper, crabapple, scarlet oak, and lacebark elm. A few of the trees that you want to avoid when planting near a paved surface due to large surface roots are red maple, beeches, live oak, pin oak, willow oak, weeping willow, and american elm. The photo below got me thinking about strip patching and when it can be ineffective. I'm not sure when each of the strip patches below were performed but you can see on the right lane that there are two different patches in the same lane. If these patches were put in at the same time then it seems to me that they should have taken the whole lane out and repaved the lane. One of the biggest issues that arise from this type of patching is not reaching compaction. Contractors will commonly look at a cracked road surface and try to save money by only digging out and paving the damaged area. This can sometimes be an effective road treatment but only if it is done correctly. The first step to a successful strip patch is to determine if a strip patch is really the right treatment. If you are having problems with both sides of the lane like in the photo above, it is a better idea to repave the entire lane. If you just have one section of the road that needs to be fixed then a strip pave may be the answer. The next step is to cut out the existing pavement. The cut lines should be at least a foot beyond the visible cracking on all sides and should be AT LEAST as wide as your roller or compactor. If your compacting equipment cannot get into the patch area to compact the material then your patch will end up raveling or you could even end up with a cracked surface again. Either of those situations are going to cost you more money and in the end, the money you THOUGHT you saved by skimping on the width of your patch will be spent on yet another patch. Once you have the pavement dug out you should take a look at the base course. If you had alligator cracking on the pavement before you dug it out you will have to fix up the base course by adding more base rock if necessary and re-compacting. Even if you didn't have alligator cracking you should still check the compaction of the base rock and make sure that everything is compacted, dry, and ready to be paved on before you add your new hot mix. Next you'll want to make sure that you tack coat all of the vertical faces in your patch. The older pavement will serve as a difficult to adhere your new hot mix to. Tack coat will help the new hot mix stick to the old pavement to reduce the chances of you getting new cracks along the joints of your patch after a month or two as the new mix and old pavement pull apart. Once you start putting your new hot mix into the patch make sure that you leave the material around 25% higher than the existing pavement. This is so that when your roller compacts the material it will come down to grade and allows a good compaction percentage. If you don't have enough material in the patch to start with, the roller will be able to compact it down to grade but once it hits the height of the existing pavement it will not be able to compact it further due to the roller being hung up on the existing pavement. It will look nice to start with but after a few months the patch will start to ravel. This is the part of patching that is really an art. I've told you that you should have around 25% higher hot mix material than the existing pavement but this will greatly depend on the type of mix you are using on the patch. Just remember that compaction is just as important in a patch as it is when you are paving an entire lane. Once you've added the new hot mix it is time to rake the material up on top of the patch area and off of the existing pavement. A common mistake that contractors make is by using the bump and fling technique. This is where the raker bumps up the material on the edge and then flings the excess material across the mat so it can be compacted into the middle of the mat. The raker should indeed bump the material up on the edge of the patch but then the material should remain there, on the inside of the crack, until it is compacted. The patch should look like the diagram below right before you start compacting. Leaving the excess material on the edge of the patch like above allows for the material to be pushed down into the joint between the existing pavement and new patch. This will help with adhesion and compaction on the joint. The first thing that the roller should do when you're ready to compact is "pinch the edges". The roller drives on the existing pavement on one side of the patch with part of the roller hanging over onto the patch. The compactor drives over the "bumped up" areas of your patch and pushes it down into existing pavement. If you had too much bumped up in this area it's ok. The excess material will be pushed out towards the middle of the mat where you might have flung it anyways, but now you have a well compacted joint instead. The roller then should do the same thing on the other side of the patch and then roll the middle of the patch. The photo I showed at the beginning of this post is an example of a poor strip patch job. Not only should the contractor have repaved the entire lane but if you look closely you will see that there is a gap between the new patch and the old pavement, probably due to any number of the issues I've discussed today. Patching and maintenance is where the owner can really lose a lot of money or save a lot of money. If you don't have the money to do it right the first time, where will you get the money to do it over? Could the consistency/mixture of the pavement be different? Or maybe the thickness of the pavement is less toward the shoulder than the center. Or flooding or excessive rain at the time it was laid or before the pavement had time to dry, could that cause this? Maybe an underground spring or just ground moisture. Or maybe the ground wasn’t properly prepared before the pavement was laid. Could tree/plant roots cause something like this? How about an earthquake or tremor? Yes! Almost all of those are potentials for this type of cracking! Typically most of those problems will cause the alligator cracking to appear in various other parts of the pavement as well, not just on the joint. Mixture variation in the pavement can cause a variety of different issues in the pavement, depending on how the mixture varied. However, alligator cracking is typically a structural problem instead of a material problem. A material issue typically means that the mixture of asphalt binder (oil) and/or rock has problems. When I refer to structural issues it is referring to the "structure" below the mixture that is being laid down. The structure is typically old pavement, base rock, or soil. So when I say that there is a structural problem, that means that there is something wrong with the underlying pavement, base rock, or soil below the new mixture that you're putting down. The thickness of the pavement is an interesting idea, if this part of the pavement had a thinner layer of pavement than was designed to hold the load, it could easily crack under the pressure. Rain and moisture at the time of paving could cause this type of cracking but more likely it will cause raveling or shoving instead. The one time that it could definitely be an issue is if the paving crew is paving over aggregate base or soil instead of existing pavement. 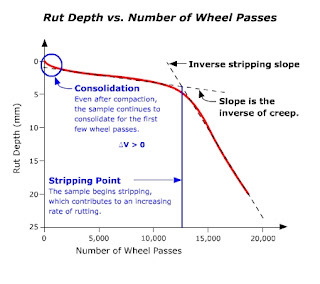 If the base course is too wet at the time of paving it will tend to move and adjust under the weight of vehicles, sort of like playdough would. This would also happen if there were an underground spring or ground moisture. I would consider this a way of poorly preparing the ground before laying the pavement because it is up to the contractor to assure that his base course is prepped and ready for the asphalt layer. This includes obtaining the correct moisture and compaction of the underlying structure. Another way that the alligator cracking could occur would be if they didn't compact the base rock enough before paving on it. 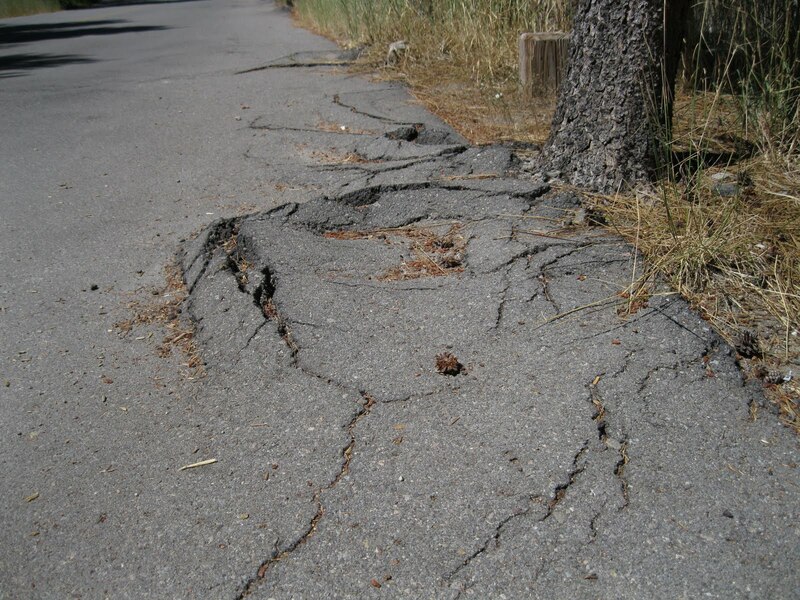 Roots and earthquakes could absolutely cause these types of cracks as well, however, if it were caused by roots you would tend to see a raised portion in the alligator cracking, where the root is pushing up on the pavement. I hope that answers your questions! Keep them coming! · There is now more detailed information for manually-operated sand equivalent shakers. It must be able to oscillate at the rate of 100 complete cycles in 45 ± 5 s with a hand-assisted half stroke length of 5.0 ± 0.2 in. · You can no longer use tap water in lieu of distilled or deionized water. · It now specifies the weight of the total starting sample weight to be 1000-1500g of passing #4 materials. Previously there was no weight specified. · There is now a note on dispute resolution for when manual shakers are used. In dispute, a mechanical shaker will be used. · The Health and Safety section has been rewritten to be less specific and generally puts the responsibility to determine the safety issues and best practices on the user. Welcome to post one of disaster roads! The pictures I'll be using for this series were taken by our readers over the fourth of July weekend. If you have a road you are curious about email it to me at toni@qualityincalifornia.com and I'll talk about it in the blog. For those of you who might not know, alligator cracking is the scaly looking pattern you see on the right side of the photo. Here the cracks have been filled in with a crack sealer which can help to slow the cracking from spreading by keeping out additional moisture. Alligator cracking is one type of fatigue cracking that can happen to a road for a variety of reasons but is most often related to overloading the pavement. Roads are designed for a variety of variables, two of the biggest are the amount of traffic and the type of traffic. A road in a subdivision may be designed for a lighter load than a Wal-mart loading dock because it is assumed that only small vehicles will be driving there instead of heavy trucks. If a road is designed for a lighter load than is applied to it, the pavement can form a pattern of these types of cracks. Often roads are designed with a lighter load in mind but some vehicles are overlooked. For instance, it seems like a fair assumption that a subdivision will only see small vehicles but the subdivision is still visited by heavy garbage trucks weekly and if there is a bus stop in the area their roads will be overloaded from the bus's weight as well. However, the road shown above does not seem to be a result of poor pavement design but more poor pavement construction. Take a look at the photo above and notice that the black crack sealant fills in a patch of alligator cracks but then continues up the road in a straight line with a couple more patches of alligator cracks as it goes. 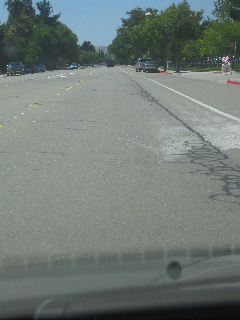 The long straight crack is the joint in which one length of pavement was laid down next to another length of pavement. Joints are common places for distresses on roads because if they are not properly installed, the joint can allow for moisture and other debris to wriggle in between the two sections of pavement making the joint a weaker part of the road way. For this very reason, Caltrans and several other government entities specify that joints be lain on lane dividers like the yellow dashed line you see on the left and the white line you see on the white. The next thing you might have noticed is that the joint is a foot or two to the left of the edge of the lane. The wheels of vehicles travel in this exact area of the lane, placing half of the weight of a vehicle on the joint in this road. The joint is already a weaker section of the road and the additional weight of the vehicle tires overload this section of the road and create a variety of small cracks in the joint that radiate out from the joint line. Over time moisture will accumulate in these cracks. Cold weather will cause the moisture to expand and the cracks will grow until they form a pattern like you see above. 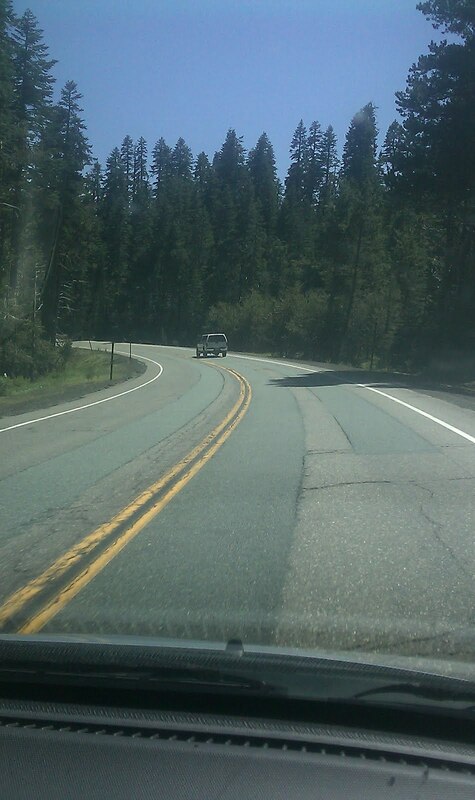 Can you think of any other reasons this road might look like this?